Now, Carrano and Niroomand are in business, making and delivering custom homemade food for dogs. Their shop? It's called DooD for Do(gFo)oD and there are now two - one in Manhatten, the other in L.A. Sharing pet food samples with their neighbors turned out to be a great way to market their DooD. In fact, the pair believes that it helped them raise $350,000 on Kickstarter, which was how they eventually shared their canine cuisine. Every dog that orders gets his own individual meal plan on DooD, based on his weight, age, and health. Diets are supervised by licensed veterinarians and contain no preservatives. 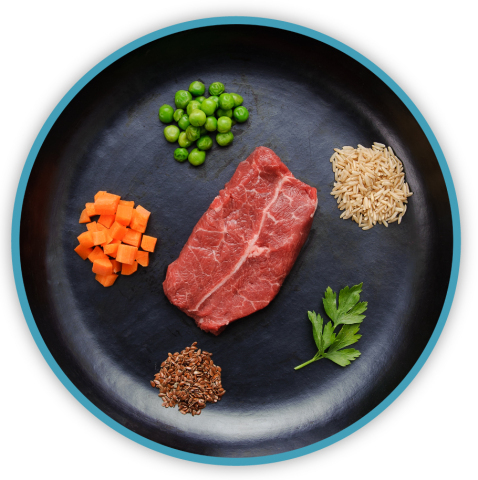 You will find that each meal is made from the very items we might be eating on a healthy diet, like the meal on the plate below. The veggies may vary somewhat depending on the major protein, which may be steak, chicken, turkey, or lamb. To order, all you have to do is live in DooD's delivery area and go to the DooD website!